WHERE’S MY WATER IS THE HIT APP THAT EVERYONE IS PLAYING. IN THIS FREE VERSION, ENJOY 20 EXCLUSIVE PUZZLES NOT FOUND IN THE FULL GAME! Swampy the Alligator lives in the sewers under the city. He is a little different from the other alligators — he’s curious, friendly, and loves taking a shower after a hard day at work. The other alligators have damaged his plumbing and disrupted the water flow. Help Swampy by guiding water to his shower! Get started with 10 exclusive levels, for FREE!SEE THE REST OF SWAMPY’S STORY IN THE FULL VERSION — COMPLETE WITH OVER 200 LEVELS AND MORE CHARACTERS! Everyone loves Where’s My Water! “Game of the Year 2011” — PHONEARENA.COM “Game of the Year 2011” — APPLE ‘N APPS “92 Metascore” — METACRITIC.COM “Editor’s Choice Award” — IGN “Game of the Month” — SLIDE TO PLAY “One of those rare gems that manages to get everything right.” — GAMEZEBO “This is the perfect game to play on the go.” — KIDZWORLD Where’s My Water? is a challenging physics-based puzzler complete with vibrant graphics, intuitive controls, and a sensational soundtrack. To be successful, you need to be clever and keep an eye out for algae, toxic ooze, triggers, and traps. • NOW WITH OVER 200 CHALLENGING PUZZLES! The fun is just beginning. Swampy’s pipes are broken and it is up to you to get the water flowing again through 10 themed chapters, each with 20 challenging levels. • MEET SWAMPY AND INTRODUCING CRANKY! The story of Swampy unfolds as you play. Swampy’s cute, he’s funny, he just wants to take a shower with his beloved rubber ducky. Cranky is the toughest alligator around and he has worked up an appetite from sabotaging Swampy’s water supply. Test your puzzle solving skills with Cranky’s Story for an additional purchase. Humorous story moments and richly-detailed graphics bring this subterranean world to life! • AMAZING LIFELIKE WATER PHYSICS Go with the flow! Swipe, slosh, and splash to guide water through increasingly challenging scenarios. • COLLECTIBLES AND BONUS LEVELS Collect Swampy’s shower items to unlock bonus levels. 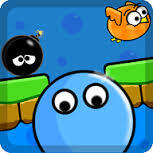 “Tri-Duck” each chapter and tap around for secret levels and even more surprises! Every drop counts in Where’s My Water? — A refreshing new puzzler filled with good clean gaming fun!